Something has been niggling me about Oryx and Crake ever since I finished reading it. I’ve been trying to put my thoughts into a review; but, for whatever reason, can’t get them into a continuous piece of prose. Rather than continue to sit here, stumped, I have decided to write down my thoughts as they occur to me, and we’ll see how that goes. Some time after the apocalypse, Snowman is the only human left alive — the only human of a kind we would recognise, anyway. The other inhabitants of this world are the Children of Crake, genetically-engineered humans who might as well be a different species, so alien are they physically and mentally. Crake — and Oryx — are god-like figures to these humans; Snowman says he was sent by Oryx and Crake, and now acts as a kind of messenger. Of course, it’s all a pretence — Snowman’s way of surviving (or justifying his existence) in the transformed world. In the past (which is still in the future), ‘Snowman’ was named Jimmy; Crake was his friend Glenn, who grew up to be the geneticist who wanted to create a better kind of human. Oryx was a child prostitute who would become the teacher of the ‘Crakers’, as she called them. Oryx and Crake the novel chronicles how one world became another. There’s something over-familiar about the worlds of both strands of the novel. In the further-future, post-apocalyptic strand, there are real marks of strangeness (like a bioluminescent rabbit, and the Crakers themselves); but I don’t feel the true frisson of alienness that I would expect from this kind of setting. Perhaps it’s a consequence of seeing this world through the eyes of Snowman (which I appreciate is vital to the story Atwood is telling), who’s the closest the book has to ‘one of us’, and therefore a way in to the world that we wouldn’t otherwise have. The nearer future — dominated by corporations, with living-spaces divided between the Compunds (where young JImmy lives) for the well-off, and the ‘pleeblands’ for everyone else — is better realised (just as well, as it’s where we spend most of the novel), but still has its shortcomings. An example of both sides: there’s a passage where Atwood describes how executions and suchlike have become a form of mass entertainment, and it comes across as pretty hackneyed to me. But then, immediately afterwards, the author puts in different terms: the culture of the body has taken over from that of the mind and soul. This, I think, is much more evocative and striking. Making the ‘last man’ such an ordinary person as Jimmy/Snowman is interesting, and perhaps closer to how such a situation might play out in reality than making him an ‘expert’ (then again, who really knows?). I appreciate Atwood’s observation that the world has become static for Snowman — he can’t move on, because there’s nothing to move on to. Even at the end, the last chapter begins in the same way as the first, as though to suggest that nothing has really changed (though perhaps it has…). But I’m not sure that this feeling is really evoked through the prose. When Oryx tells Jimmy about her past, he can’t understand why she’s so at ease with what happened to her (it’s because she feels it could have been much worse); this is mirrored by a rosy glow to the writing that contrasts most effectively with the grim nature of the events themselves. But I don’t think Atwood matches prose to effect quite as well as this in the rest of the book. 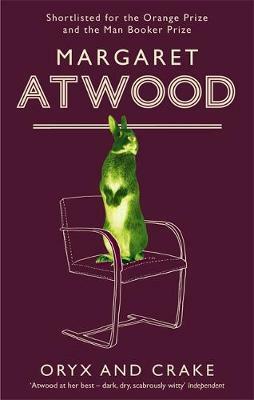 We don’t learn the nature of the catastrophe that befell the world until over halfway through Oryx and Crake — and it doesn’t matter so much even then, because it’s the ethics in which Atwood is most interested. And there are real dilemmas to think through here, most clearly embodied in the differing views of Crake and Jimmy/Snowman. For example (I may be skating over some philosophical questions here, but please indulge me): if you could remake humans so that they lost some of their negative attributes and became better adapted for survival, but in the process they lost some of their capacity for free thought — if they became less recognisable to us as ‘human’ — would that be the right thing to do? Atwood offers no firm answers. I chose to read Oryx and Crake now as a prelude to reading The Year of the Flood (which I should be getting to next). I’m curious to see how the two will compare.